« AirRide Talks OK’d, Ypsilanti to Join AATA? March 27 was the first meeting for AAPAC’s two new commissioners, Ashlee Arder and Nick Zagar. Arder, who works for ArtServe Michigan, took action during the meeting to set up a Twitter account for the commission: @AAPublicArt. At AAPAC’s March 27 meeting, Bob Miller reported on progress of the Ann Arbor city council committee on public art. Five councilmembers – Sabra Briere, Stephen Kunselman, Sally Petersen, Christopher Taylor and Margie Teall – have been meeting since December 2012 to develop recommendations for the city’s public art program and revisions to two city ordinances that affect that program – Chapter 8 (organization of boards and commissions) and Chapter 24 (public art). Miller reported that the committee is interested in soliciting feedback. “I don’t seen any changes coming quickly,” he said, “but I do see changes coming.” He challenged commissioners to come up with projects that don’t rely on city funding, and that involve outside partners. “We’re reshaping ourselves,” he said. 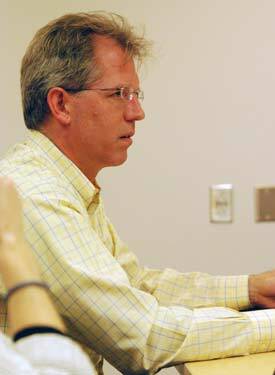 Ann Arbor city councilmember Stephen Kunselman (Ward 3) at the April 18, 2013 meeting of the council’s public art committee. The meeting was attended by all five councilmembers who serve on the committee, as well as assistant city attorney Christopher Frost and Craig Hupy, the city’s public services area administrator and senior manager who’s responsible for the public art program. Representing AAPAC were Bob Miller and John Kotarski. The current city’s public art ordinance requires that 1% of all capital project budgets be set aside for public art. But at its Dec. 3, 2012 meeting, the council put a temporary halt on that set-aside and on spending of existing fund through April 1– except on projects already in the works. At the same December meeting, a council committee was formed to review and suggest revisions to the city’s public art program. The effort followed a failed millage proposal in November 2012, which was meant to provide an alternative funding mechanism to the Percent for Art approach. At its April 1, 2013 meeting, the council extended the spending moratorium until May 31. Eliminate the Percent for Art funding mechanism, which requires that 1% of all capital project budgets be set aside for public art. Eliminate the “pooled” funding approach. That approach entails setting aside Percent for Art money from projects into which it would be difficult to incorporate public art. Those funds are combined from different projects and used for artwork in other locations, but thematically linked to the original funding source. Identify capital projects that can be “enhanced” with public art or architectural features, and allocate funding for those enhancements. Encourage additional fundraising for community‐generated public art projects. 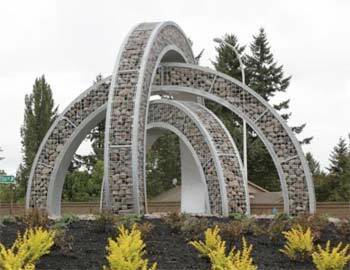 In addition, the committee is recommending that a public art administrator – either city staff or a contract employee – be more than a part-time position. Currently, the city’s public art administrator, Aaron Seagraves, is a part-time city employee. The nine-member Ann Arbor public art commission would remain in place as an advisory body, with three-year terms. Term limits had been considered by the committee, but ultimately were not added as part of their recommendations. The public art commission would continue to produce an annual public art plan with a list of recommended projects. The public art ordinance currently requires that the plan be delivered to the city council by April 1. That deadline will likely be moved to an earlier date to better synch with the city’s budget planning process. Petersen said she wanted to ameliorate the concerns raised by some members of the public regarding pooled funds and the lack of a city attorney’s opinion regarding the original Percent for Art ordinance. Christopher Taylor took issue with the perception about the lack of an opinion from the city attorney’s office, saying that the city’s legal staff had been very involved in drafting the original ordinance. Based on discussion among councilmembers at the April 18 public art committee meeting, the ordinance revisions likely will be on the council’s May 6 agenda for first reading. The expectation is that the item will be moved to a second reading on May 20, but then postponed until the council’s June 3 meeting for a public hearing and final vote. Between the May 6 and June 3 meetings, the committee plans to post a survey on A2 Open City Hall to solicit feedback on the proposed revisions. Petersen wondered whether other councilmembers would be open to amending the proposal, based on feedback from A2 Open City Hall. Other committee members, including Christopher Taylor and Margie Teall, indicated that they would be open to making amendments, if necessary. Taylor noted that if the proposal were amended significantly at second reading, it would need to go back for a first reading again. Petersen agreed to work with Lisa Wondrash, the city’s communications manager, to draft questions for A2 Open City Hall. 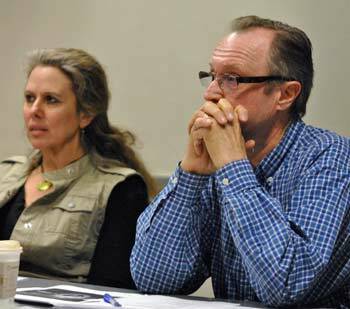 AAPAC’s March 27 meeting was the first for two newly appointed commissioners: Ashlee Arder and Nick Zagar. Each of them gave brief comments about their backgrounds during the meeting. 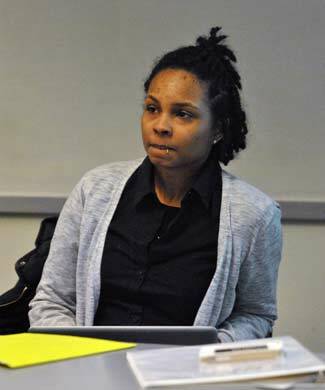 Ashlee Arder, one of the newest members of the Ann Arbor public art commission, attended her first AAPAC meeting on March 27. Zagar told commissioners that he grew up in Ann Arbor, attending Eberwhite Elementary, Slauson Middle School, and Pioneer High. He has a fine arts degree from Corcoran College in Washington, D.C., and a masters of fine arts in painting from Washington University in St. Louis. For the past eight years he’s been living in New York City working in commercial real estate, but recently took an opportunity to move back to Ann Arbor. He said he’s excited to be back. He has a deep passion for public art and looks forward to being involved. Arder is programs coordinator for ArtServe Michigan, a statewide nonprofit advocacy organization. She has an undergraduate degree from the University of Michigan and while there was heavily involved in other arts advocacy efforts. She said she recently moved back to Ann Arbor and is interested in getting involved again in the arts here. Later in the meeting Arder discovered that AAPAC didn’t have a Twitter account, so she set one up before the meeting adjourned. The Twitter handle is @AAPublicArt. Commissioners considered a proposal by John Kotarski to expand AAPAC’s membership by adding three positions designated for students. He proposed that each of the student commissioners would be selected by: (1) the Ann Arbor Public Schools board of education; (2) the dean of the University of Michigan School of Art & Design; and (3) the Arts at Michigan program. Deb Mexicotte, president of the AAPS board, is also program coordinator for Arts at Michigan. Kotarski suggested that these student positions be for one-year terms. He thought the approach would distribute ownership of the city’s public art program, and provide outreach to communities that are otherwise difficult to reach. He told commissioners that he had discussed the idea with some councilmembers who are on the committee that’s reviewing the public art program, and they were supportive. Kotarski said AAPAC could make this recommendation to the council committee, but he thought it was the mayor who would actually make a decision about whether to implement it. Marsha Chamberlin clarified that the city’s public art ordinance governs the membership of AAPAC. Given that ordinance revisions are being developed, now would be the time to make a change, she said. However, her preference would be to make ad hoc appointments, so that the ordinance wouldn’t need to be amended. Bob Miller, chair of the Ann Arbor public art commission. In the background is AAPAC member Marsha Chamberlin. Bob Miller indicated support for Chamberlin’s suggestion, saying it would be easier to bring people on if it were handled less formally. He also questioned whether the students should be full voting members, and wondered if that would be appropriate. He wanted to make sure that the students got something out of the experience, and felt that high schoolers would need more guidance than college students. Kotarski argued that students should have “full citizenship” on the commission. The intent is to get fresh voices on AAPAC, he said, but also to engage these community stakeholders – the university and public schools – by putting the appointments on school leadership’s agendas. He didn’t think it would be a bad thing for the mayor to have a conversation once a year with the UM art school dean or the AAPS board president. As for the students’ participation, Kotarski felt they would rise to the occasion. “They’ll probably be more diligent about this than some of us,” he said, referring to service on the commission. Kotarski made a motion to communicate with the city council’s public art committee, telling councilmembers of the desire to include students on the commission. Outcome: On a 5-1 vote, commissioners voted to ask the city council to add students to AAPAC’s membership. Marsha Chamberlin dissented. After the vote, Chamberlin told commissioners that she liked the concept, but didn’t like this approach. She’d rather handle it informally, perhaps by including students in the task forces that are set up for each project. Miller asked what needs to happen in order to move this effort forward. Craig Hupy – the city’s public services area administrator who also attended AAPAC’s March 27 meeting – said Aaron Seagraves, the city’s public art administrator who reports to Hupy, would write a memo about the proposal and send it to the council’s public art committee. Commissioners have discussed the plan at previous meetings, and provided suggestions via email as Aaron Seagraves, the city’s public art administrator, developed the draft. AAPAC will coordinate the creation of public art in more areas of the city and is committed to balance the number of artworks throughout the city and its neighborhoods. AAPAC will value areas of high use and visibility as locations for public art because they contain the greatest potential audience. AAPAC will site public art at underserved areas. Argo Cascades, a new park amenity and a great setting for art. East Stadium Boulevard bridges, located at a cross-section of traffic. Kingsley Street and First Street rain garden, to be coordinated with the rain garden’s design and installation. Detroit Institute of Arts’ Inside|Out program, the City is acting as a Community Partner with the museum to display famous works from their collection in public spaces. Memorial to Coleman Jewett, using Mr. Jewett’s Adirondack chair design as the inspiration. Sidewalk Chalk project focusing on stormdrain education in conjunction with the Huron River Watershed Council. A Canoe project using recycled canoes as the medium for an art display in partnership with several community organizations. Kotarski noted that a private donation of $5,000 has been offered for the Jewett memorial, but only if the memorial is a bronzed replica of one of Jewett’s chairs. Kotarski was concerned about the phrase “design as an inspiration,” which seemed to imply that the memorial might not be an exact replica. He suggested removing the phrase “as an inspiration.” There seemed to be consensus to make that change. Outcome: Commissioners unanimously approved the fiscal 2014 annual public art plan, to be forwarded to the city council as an item of information. A recommendation was on AAPAC’s March 27 agenda to select Josh Wiener, an artist from Denver, to work with landscapers and incorporate public art into a new rain garden at the corner of Kingsley and First. Task force members making the recommendation are Connie Brown, Jerry Hancock, Claudette Stern, John Walters and Jeff Kahn. A metal and rock sculpture by Josh Wiener at a roundabout in Happy Valley, Penn. This image was part of a slide show presented at the Ann Arbor public art commission’s March 27 meeting. Aaron Seagraves gave a slide presentation of Wiener’s work. Commissioners were also provided a written proposal from Wiener, as part of their meeting packet. [.pdf of Wiener's proposal] The project has a total budget of $27,000, though the artist’s contract would be for $23,000. Connie Brown reported that 11 proposals had been reviewed, and two artists were selected to be interviewed in early March. Wiener was selected as the finalist in part because he had “more robust qualifications,” she said, as well as a flexibility that would be valuable in collaborating with the project’s landscape architect. This step was to select the artist, Brown explained. Wiener would then work with the landscape architect – Conservation Design Forum (CDF) – to develop a design for the artwork, which will also be reviewed by the task force. The process will include a public forum to get feedback from residents. The project is expected to be completed by the fall of 2013. Craig Hupy, the city’s public services area administrator, clarified that because the artist’s contract is under $25,000, it does not need city council approval. John Kotarski thought that the council should still receive a memo about the selection, outlining how this artist had been selected. Outcome: Commissioners voted unanimously to select Josh Wiener for the rain garden public art project. 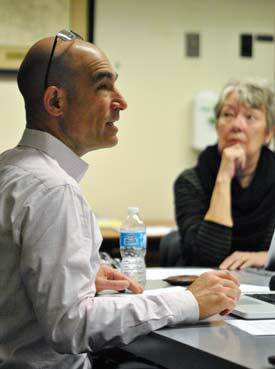 Several projects were discussed briefly during the March 27 meeting, by way of updates. Additional information was also included in a written report by Aaron Seagraves, the city’s public art administrator. Marsha Chamberlin reported that Sarah Gay had written up a project plan, but subsequently Chamberlin hadn’t heard from her in about three weeks. If she didn’t get some kind of communication from Gay soon, Chamberlin said AAPAC should take over the project themselves. By way of background, at a special meeting on March 7, 2013, AAPAC had voted to accept a memorial for Coleman Jewett as an official AAPAC project and to approve Sarah Gay as a volunteer project manager. Her duties were to lead efforts for city council approval, donor relations and fundraising. The proposal is for a bronze Adirondack chair at the Ann Arbor farmers market. Jewett was a long-time local educator who died in January. After he retired, he made furniture that he sold at the Ann Arbor farmers market. A private donor has committed $5,000 to create a memorial at the market, in the form of a bronze replica of one of Jewett’s Adirondack chairs. John Kotarski indicated that Gay had been working on the project. Chamberlin said she didn’t mean to imply that Gay wasn’t doing anything, just that she hadn’t heard from Gay. Another update is expected at AAPAC’s April 24 meeting. The Ed Carpenter glass hanging sculpture in the lobby of this building, next to city hall at the corner of Huron and Fifth, is set to be installed during Memorial Day weekend on May 25-26. Aaron Seagraves indicated that drywall work is already being done to prep for the installation. Marsha Chamberlin asked whether it was time to schedule a dedication ceremony. Bob Miller suggested reaching out to Margaret Parker, a former AAPAC member who co-chaired the task force that recommended Carpenter for this project. He felt she might be willing to plan the dedication. Craig Hupy suggested coordinating it with the mayor’s office, to ensure that the city council is included. The four artists selected as finalists for artwork on the East Stadium bridge would be coming to town for an April 1 site visit/open house, Aaron Seagraves reported. Those artists are: Volkan Alkanoglu, based in Atlanta, Georgia; Sheila Klein of Bow, Washington; Rebar Group of San Francisco; and Catherine Widgery of Cambridge, Mass. 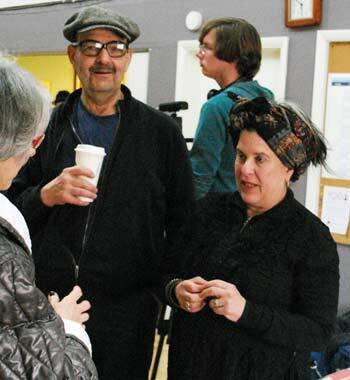 Artist Sheila Klein, right, talks with Nancy and Harvey Kaplan at an April 1, 2013 open house for four artists who are finalists in East Stadium bridge public art project. The open house was held at the Ann Arbor senior center in Burns Park. The Chronicle attended a portion of the April 1 open house, held at the Ann Arbor senior center in Burns Park. Artists were on hand with images of their work in other communities, and about 20 or so members of the public were there at the time The Chronicle stopped by. While they were in town, the artists also were given a tour of the city and the University of Michigan campus, and toured the East Stadium bridge site to get a sense of where their work would be located. The four finalists will be returning to Ann Arbor in a few weeks to make presentations of their proposals, with additional opportunities for public input. Aaron Seagraves reported that over 50 entries were received for the public art project at Argo Cascades. A selection panel would be meeting in April to begin evaluating the proposals. Members of the selection panel include John Kotarski, Malverne Winborne, Cheryl Saam, Margaret Parker, Cathy Fleisher, Bonnie Greenspoon and Julie Grand. Installation on the Detroit Institute of Arts’ Inside|Out program artwork took place two days after AAPAC’s March 27 meeting. Framed replicas of paintings from the DIA collection were mounted at these locations: Justice Center (Fifth & Huron); downtown fire station (Fifth & Ann); Lena (Main & Liberty); Kerrytown Market & Shops (Fourth & Kingsley); Sculpture Plaza (Fourth & Catherine); Zingerman’s Deli (Detroit & Kingsley); and the Liberty Street alley near Main Street. John Kotarski reported that he and city councilmember Sally Petersen were working to organize bus trips to the DIA on April 20 and 21, when Ann Arbor residents would get free admission as part of the Inside|Out program. In addition, free docent walking tours of the installations will be offered on Saturdays and Sundays, starting on April 27. The tours will leave from the Ann Arbor Hands-On Museum every half-hour between noon and 3 p.m.
Marsha Chamberlin has been exploring the possibility of including artwork at the City Apartments project being built at the corner of First & Washington. When the project was originally proposed several years ago, there had been discussions about including public art in the public parking portion of the building, located on the lower levels and managed by the Ann Arbor Downtown Development Authority under contract with the city. Until a few weeks ago, the last time that the public art component had been brought up publicly was at AAPAC’s October 2008 meeting, in connection with a possible partnership with the DDA. Chamberlin is the only current commissioner who was also serving at that time. On March 27 she reported that public art there “is a project that doesn’t seem to have much traction.” Village Green, the developer of City Apartments, doesn’t have funding for it, she said, so she wouldn’t recommend that AAPAC make it a priority. She agreed that it should remain on the table, but didn’t think the commission should take any action at this point. Marsha Chamberlin reminded commissioners that it’s time to be soliciting nominations for the annual Golden Paintbrush awards, which recognize local contributions to public art. Last year’s winners were Jim Cogswell, David Zinn and Margaret Parker, a former AAPAC chair. The award winners are selected by AAPAC, with a presentation at an Ann Arbor city council meeting in June. Commissioners present: Ashlee Arder, Connie Brown, Marsha Chamberlin, John Kotarski, Bob Miller, Nick Zagar. Also: Aaron Seagraves, the city’s public art administrator, and Craig Hupy, the city’s public services area administrator. Absent: Wiltrud Simbuerger, Malverne Winborne. So…we have term limits deleted from the draft (shades of the DDA), using the remaining looted 1% pool of funds for future projects, a increase to a full time city employee to coordinate the projects and a Public Arts Commission so cluelessly suggesting three additional ‘student’ members of the Board when the Council Task force has a near final proposal to present that’s taken several months. And, two new board memmbers who ‘just’ moved back to Ann Arbor and haven’t been living locally in the recent past. Plus City Council members still falsely claiming there was a written legal opinion on the legality of the orignal Per Cent program. It’s a strange day when Marsha Chamberlin, with her comments on expanding board membership, is the voice of reason. But the one per cent tax being elimated is good news. The trouble with this and all city boards is that membership is only available to those who are ‘in the loop’ it doesn’t matter how qualified or eager to serve one might be, if you are not pre-approved by those in charge there is no chance that your voice will be heard. Just take a look at the citys lists of boards and committees and try to find someone who wasn’t appointed by John Heiftje. I know the mayor has the power of appointment, so he has been mayor for so long everyone serving the city in an advisory role is his pick. But it goes beyond this, I and others I know have applied for many open positions, including on this arts advisory board, and … No response at all. And when they do want to expand board size, it is with restrictions (read:already choosen) on who may serve. Frustrating for those who want to have ANY input, outside of the voting booth, as to how our city is run. I was driving by West Park and could see those two orange metal trees standing near the historic bandstand. I was squinting at them and trying to see them as beautiful. I heard on the TED/NPR radio hour the other day that you can change your perception of art that way. The appearance that commissions sometimes decide things is just that—an appearance. Mostly their actions are predetermined, either by where the administration and staff are leading them, or by council (who have one or two reps on most commissions). If not, they’re ignored or their recommendations are sent to the black hole of the attorney’s office. Those that are adopted by council are done so because that’s what council wanted in the first place. Mostly that’s all that gets to council because the gatekeepers on the commissions ensure it. Politicians don’t want to get elected so they can listen to commissions. They do it so they can ‘get things done’. Or at least appear to. But then maybe the eleven years I served on city commissions during the current mayor’s terms in office are obscuring my memory of the twelve years that I served on committees and commissions under earlier mayors (and councils). Maybe. Maybe it’s just this mayor who somehow chooses appointees so adeptly that they all carry out his wishes, and that will end when he’s out of office. I have friends on many commissions and on council. I consider the mayor a friend. I love them all. What I wrote above about politicians isn’t really accurate is it? Most people—not just politicians—operate on fear. Maybe someday we can have a commission on fear. That might be worth serving on. I look forward to a lively discussion of this. And I look forward to being judged. And I look forward to being proven wrong. I’d much rather be free than right. I, too, served many years on committees and commissions. Sometimes it was worthwhile, sometimes not. Commissions are effective, in my experience, when they can say and do things that simply cannot be ignored by the politicians. My time on the Parks Advisory Commission was, by and large, rewarding. This was many years ago, of course, and local politics were much different back then. There was still a 2 party system then, and there was still some noblesse oblige on the part of the majority when it came to appointing members of the minority. Even my time as chair of the first public arts commission was productive, in that we installed 4 major public art pieces in the city, and did it with mostly private funding. But I’m not ready to serve again. Partly because of the process I suffered through. The inquisition I got was about as severe as a Supreme Court appointee. And, I don’t think the political climate is right for serious public involvement in public issues. So I’ll stay retired, write my book and build my cars. It’s troubling that the staff of the Public Art Commission continues to get bigger, but the job does not get done better. Lots of deliberation, very little public good. I hope by “students” they mean Ann Arbor Public School students, not U of M students, but from the article, it seems it could mean both.